The horseshoe lace stitch is a beautiful lace pattern you just have to try. It's a little more challenging to knit but shouldn't be too difficult to tackle. And if you're interested in knitting lace this stitch pattern is a great place to start. I'm sure you'll be able to manage it, plus it will be great knitting practice. The horseshoe lace stitch reminds me of a pretty chevron pattern as the eyelets zigzag across the fabric. It also creates a lovely scalloped edge which makes me think of a lovely lace shawl or simply a lovely scalloped edging or border. This lace knitting stitch pattern will look lovely in things like shawls, scarves, hats, socks, blankets and well...you guessed it --- just about anything you'd like to make. This is a little extra information on Shetland lace knitting so please feel free to jump down to the bottom of the page for the stitch pattern if you like or keep on reading. I did a little research on Shetland lace. I just couldn't help myself. You see I've heard names like Shetland lace, Estonian lace, English lace and many others. The thing is there is a history behind those names. There all lovely but I just wanted to understand a little more about the traditions behind it. Since the horseshoe lace stitch pattern is a Shetland lace pattern I wanted more information on Shetland lace. Well I found a wonderful YouTube video describing the Shetland Lace tradition and I want to share it with you. It's not a how-to video but rather a video describing and showing a time honored tradition that I now appreciate even more. I hope you enjoyed that as much as I did. There are so many wonderful knitting traditions and I love learning about them. If you'd like to knit a sample you can cast on either 21 sts or 31 sts. I used 31. I hope you liked this stitch pattern. 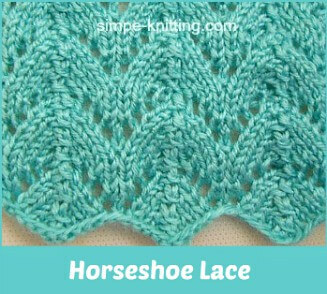 Would you like to try the horseshoe lace stitch in a knitting pattern? Great! I found a lovely scarf knitting pattern for you on the Red Heart Yarns website. It's already in PDF form too so you can just download the pattern.